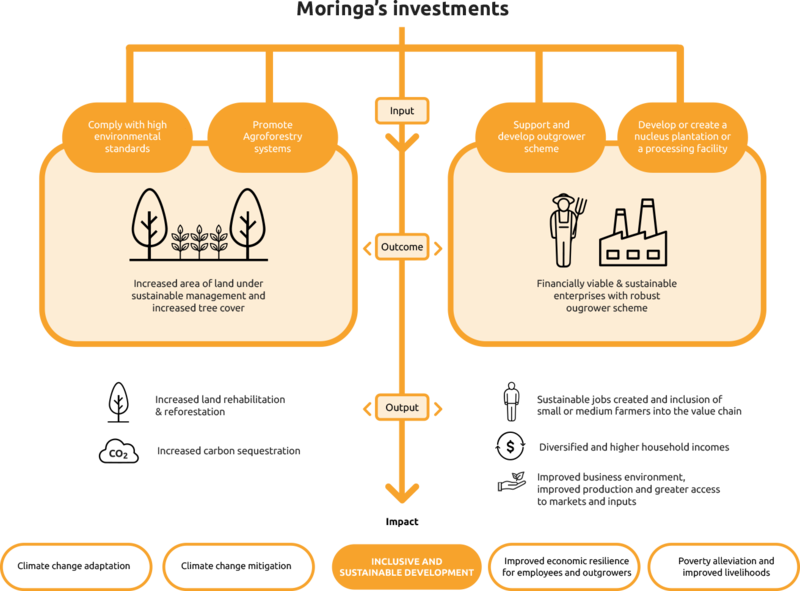 Moringa promotes an integrated landscape approach of investment, advancing continual learning, adaptive management, awareness of multiple scales issues and interactions, landscape multifunctionality, participatory approach and joint company/community value creation. Through the development of outgrowing schemes, Moringa intends to strengthen stakeholder capabilities and increase landscape and farmers’ resilience. Agroforestry is seen as a catalyst for creating shared value among an integrated value chain and a means to create socio-economic synergies and enhance livelihoods alongside with climate change mitigation and adaptation. This holistic approach appears as a new way of financing landscape – an approach that was lacking before – bringing different actors together and leading to inclusive value chains and triple win impacts. Main focuses of Moringa’s investments contribute to the achievement of 10 of the SDGs.